A traditional English Father Christmas, not to be confused with the modern gift bearing chap, this one has his roots in the Roman God Saturn and is more likely to have a pint in his hand than a sack of toys. Often linked with the Green Man or Holly Man, a pagan character decked out from head to foot in foliage, looking more like a tree than a person. 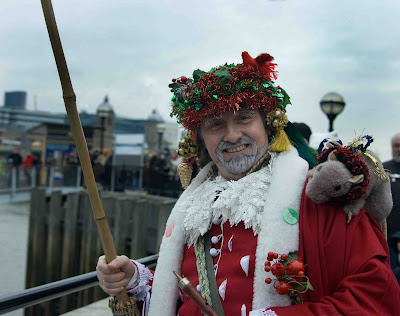 The Twelfth Night Celebrations performed at Bankside yesterday began with the Green Man rowed to the banks of the Thames and greeted by Father Christmas. The gathered crowd led by the Bankside Mummers and the Holly Man toast the people, this is known as wassails. A traditional folk play follows, a dual, a doctor with a magic potion, a resurrection and a hero. Cakes are then handed out to the crowd. Hidden in one is a pea and in another a bean. The finders become King & Queen for the day. He appears to be a cheerful sort! How nice, Mo. I did not know about this celebration. Thank you for this. I learn something new every day with you! All the best. Ciao. A. Isn't this so much better than what we have in our age? Now he is only there to help the shops sell more. Great shot - he reminds me of the Burger King king, lol. There a lot of pubs in the West Midlands were I'm originally form that are called the Green Man, all from legend. Very interesting post, and what a jolly fellow he looks. That's a great picture - and lovely to see the origins of Christmas as part of a modern festival.